By my second year in college, I felt this sense of urgency that the way traditional classes were taught had to change. They were textbook reliant, sometimes irrelevant, included group projects where other students had zero desire to actually work in groups, and seemed so incredibly distant from the actual skills needed in the workforce. But as a student, we’re often told that we just have to “deal with it.” For some reason, I believed I could actually change that, and that initial inclination has made all the difference. On April 21st, 2015 the Mel Rines Student Angel Investment Fund, hereinafter referred to as the Rines Angel Fund, launched at the Peter T. Paul College of Business & Economics. The Rines Angel Fund has a significant amount of moving parts. Yes, we are a two-credit course. But, 100% of the learning that occurs in the actual classroom is completely external. Students are given the responsibility of finding great entrepreneurs, researching opportunities for startup ventures, working with many experienced investors, and making smart investment decisions. We take every aspect of business and merge it all into one mission: Provide the opportunity for students at the University of New Hampshire, regardless of their educational background, to positively impact the global entrepreneurial ecosystem. Many of the startups we analyze have large economic footprints that go far beyond the New Hampshire, New England, and United States landscape. As the first undergraduate student-run angel investment fund to co-invest alongside angel investors in North America, the Rines Angel Fund is making a real impact. I am fully confident that each student who participates in the program in the years to come will be among the future business leaders of our generation. Already, I am proud to say that two students in the program have founded their own companies, several have gone off to work at high-growth startups, and some have begun consulting part-time outside of class. 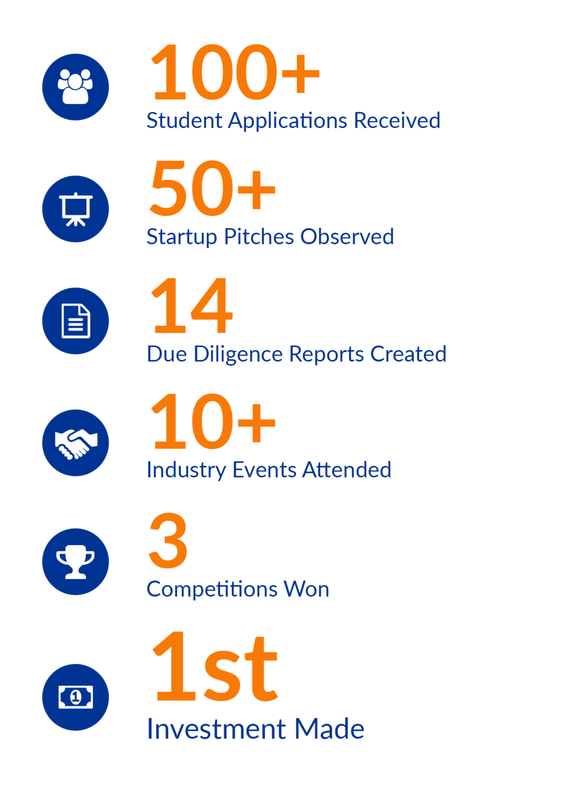 Within our first year of launching, we have made remarkable strides. For example, our team has seen more than 50 startup pitches, participated in several entrepreneurial forums, competed in prestigious global competitions, engaged with the U.S. State Department in hosting business leaders from Pakistan, Oman, and Canada, and we have made our first investment in a Cambridge, Massachusetts-based company called, Platelet BioGenesis. To say it's been a challenging year is certainly an understatement. However, it has been incredibly rewarding. I would like to specifically thank Mel Rines, an amazing and generous individual, who is dedicated to investing in the future of the students who attend the University of New Hampshire. I would also like to thank Laura Hill, the Rines Educational Program Coordinator and Jeffrey Sohl, the Director of the Center for Venture Research, who have been strong supporters of all of my ambitious ideas and who are passionate about improving academic experiences for students. Additionally, I would like to thank the founding Executive Committee Brianna Leclerc, Matthew Haskell, and Cassidy Croci, who have assisted me in developing the program. And, most importantly, I would like to extend my gratitude to the inaugural members of the Rines Angel Fund who have consistently pushed me to improve as leader. Moreover, they have been the number one reason why the program is what it has become today. I look forward to seeing what next year’s Executive Committee will accomplish, and I hope you enjoy reading the first-ever Rines Angel Fund Annual Report!